The vegetation in Skyrim certainly looked pretty. Overall Skyrim offered plenty of opportunities for sightseeing, and the southern border with Cyrodiil (the setting of Oblivion) featured luscious grass and tall, imposing trees. 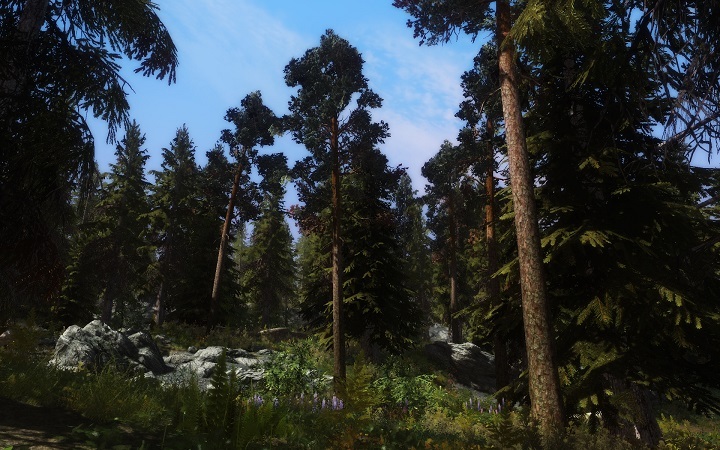 And the Skyrim Flora Overhaul attempts to make Skyrim’s vegetation even prettier. According to the author it adds “wind bent pines, maple and aspen” and “more varied and better looking flora”. And although the Dragonborn is not a botanist, but a world-saving hero, you can still admire the new vegetation. Some of the trees are huge and make Skyrim’s forests even more magical. But bear in mind that this mod is quite taxing on your computer, and there is a basic version available in case your PC cannot handle the regular edition.